The foot of Kalnik, on which is located a mountaineering cabin, looks powerful and defiant. At the beginning of the forest interrupted with footpaths, close to the remains of the historically wealthy Old Town, which is currently undergoing reconstruction, as if all that it has passed through in the last 800 years was not enough so that it is hungry for a new past. And if the remains of the walls could speak, they would have something to say about the heroism and superhuman resistance during the Mongol and Tatar invasions, when King Bela IV endowed the Kalnik fortress commander Filip Bebek. They would also remind us of the Renaissance rule of the Emperor Sigismund, who was a frequent and welcome guest there of his wife Barbara Celjska (the Black Queen). Legend says that the brave villagers saved Bela IV from a Tatar attack, chasing away the greedy robbers with plums! After this heroic exploit, they all received noble titles, and the people were remembered as plum growers. Today’s travellers are not hiding from the Tatars but from the noise and stress of the city so as to rest their spirits in peace and quiet. 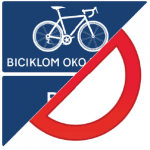 The content of this web page has been prepared with the financial support of the European Union and is the sole responsibility of the City of Križevci, the project partner Balatonszemes District, and the owner of the web page, the Križevci Association of Bicyclists, and in no way can it be considered necessary to maintain the attitudes of the European Union or the administrative body.